A three-quarter length oblique portrait of a married woman wearing an ?ostrich egg-shell bead waist band fringed with leather strips, holding a bundle of firewood on top of her head. She is wearing a neck ornament of twisted leather with twisted iron pendants. This image was given or lent to Evans-Pritchard possibly by C.G. Seigman and seems to have originated from Yuzbashi (i.e. Captain) Talib Ismail, a sub-mamur in the Upper Nile Province administration at Akobo from 1920-27. Manual Catalogues [typewritten, entitled "Nuer Photographs (E-P)"] - 206. Woman carrying firewood (L) [large size]. Morton, Chris. 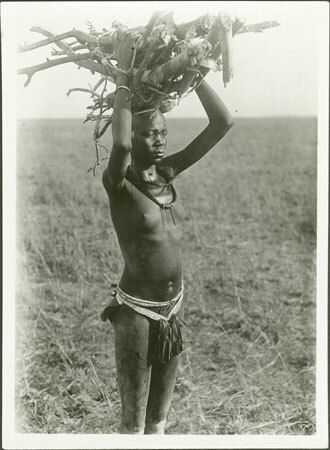 "Nuer woman carrying firewood" Southern Sudan Project (in development). 03 Jan. 2006. Pitt Rivers Museum. <http://southernsudan.prm.ox.ac.uk/details/1998.346.206/>.